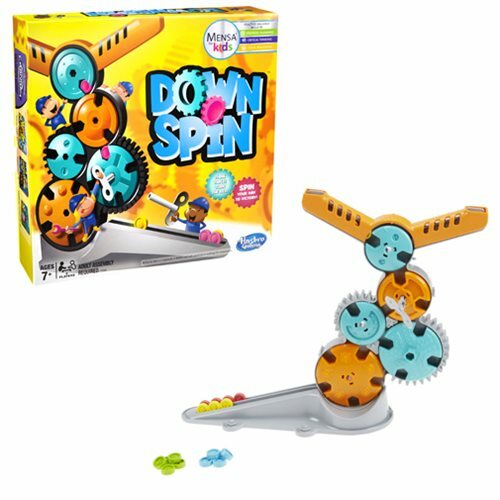 The Downspin game is a game of gears, twists and turns, and strategy. Players take turns using their game key to turn one gear at a time, as they work their way toward getting all of their tokens from the top of the chute, through the gears in the shortest path, and down into the bottom chute first to win. Players need to be strategic and think ahead! Every move could actually help opponents on their side of the game unit. The first player to get all 10 of their tokens into their chute wins. While players try to outwit their opponent, they can practice valuable skills in strategic planning, critical thinking, and visual reasoning. This game was reviewed by Mensa for Kids. Includes Downspin unit, chute, launcher, 5 "A" gears, 5 "B" gears, 2 keys, 20 tokens, and instructions. Ages 7 and up. For 2 players.